Help: I don't know how I got here but I just want to see the topo maps. Click here. 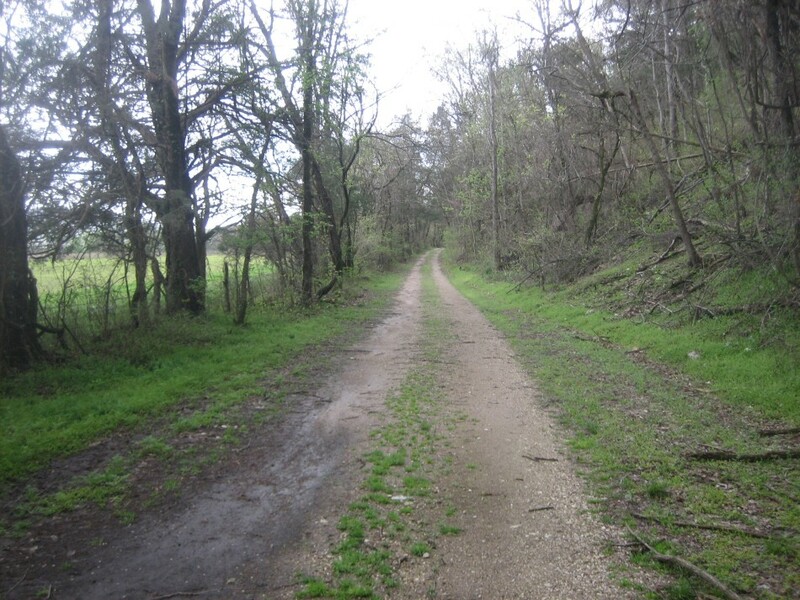 Woolum to Fairview: Although the title of this page is Fairview to Woolum, the trail description is actually in reverse. The narrative begins at Woolum at about mile 165 and tracks west for 40 miles to Fairview, mile 125. Woolum is at the junction of the Buffalo River and Richland Creek. 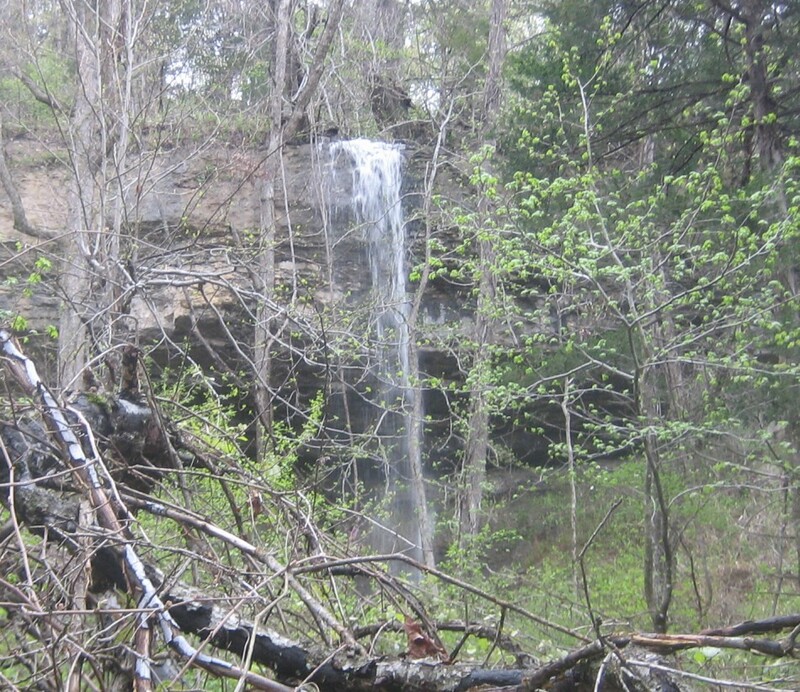 Across the creek is the Eastern Section of the Buffalo River Trail that can take you all the way to US Highway 65. Fairview Recreation Area is found on AR Highway 7. Important information about high water. This is not a particularly difficult section to hike but there are a few water issues you should plan for. The first is the Woolum access. 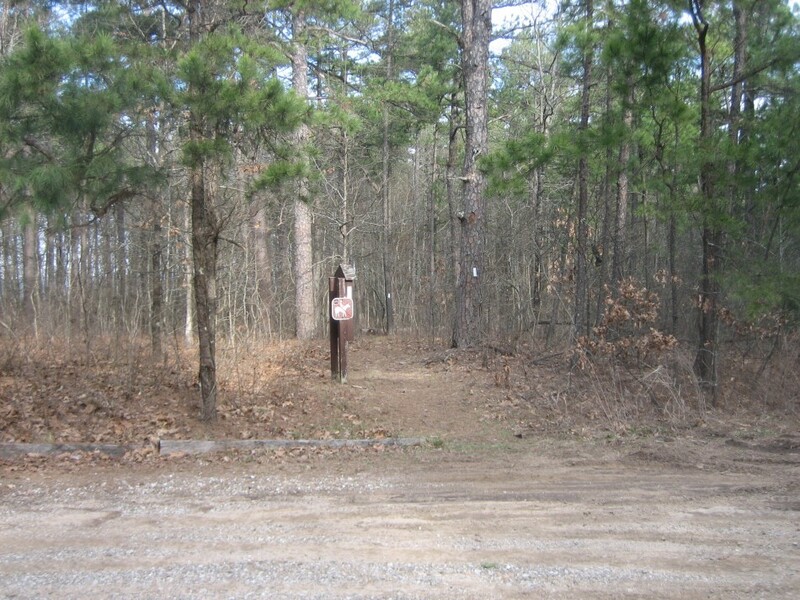 The trailhead is at the end of the park road which can be accessed from 3 directions, 1) via the Richland Rd off AR Highway 377 out of Snowball, 2) via FR 1201 out of Dickey Junction, or 3) via FR 1211 over Horn Mountain. None are dependable. Both 1 and 2 required crossing Richland Creek. 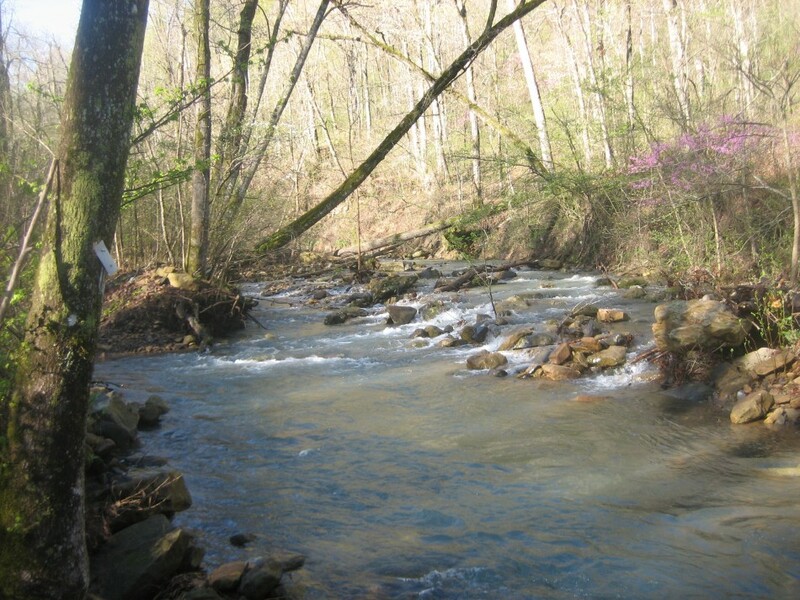 Number 1 just involves crossing the ford near OHT mile marker 161, located where the trail leaves the park road. Number 2 has two fords, the one near mile 161 and the Eula Ford. If Richland Creek is up, you cannot cross either of these. If you park your car at Woolum and it rains while you are on the trail, you may have to wait several days before you can get it out. So Number 3 is the way to go, right? The trouble with Number 3 is there is a gate at the top of the mountain that can be locked. We were told it was just locked because of high water, but sometimes what the park or forest service tells you isn't always right. It may always be locked. If it is unlocked, it looks like you can drive down the mountain and maybe get to the park road, but there are 3 creek crossing (a tributary of Richland) and a second gate at the park road. We hiked this section in March 2012 and arrived right after a series of heavy rains. Our only option was Number 3. We were using Moore Outdoors to shuttle us so we were not going to have to backtrack to pick up a vehicle or worry about it being stuck behind a newly locked gate. To get to the gate it took about 2 hours of driving on the forest roads. All of them were drivable with a regular car, though you might do some belly rubbing with a car with very low clearance. Also, roads do deteriorate and need regular upkeep. What was true for us may not be true for you. The gate is on Map 17 and marked on with three x's (in the NE quarter of Section 18, about 1.3 miles west of OHT mile 163). We followed the road until it began to switch back down the mountain and opted to follow the abandoned forest road shown in gray the map. It is overgrown, in no way passable by vehicles and unmarked. Once crossing the berm at the bottom, you will be on the park road just north of Point Peter. The second thing to keep in mind is that you will have to cross Richland Creek on the trail near Moore CCC. Too much rain and you will need to use FR 1203 near the Moore Trailhead and comeback to the OHT on the Moore CCC spur. It is quite possible that even with the downstream fords near Eula impassible when you start, that after a couple days the water level at Moore CCC may be low enough to cross. 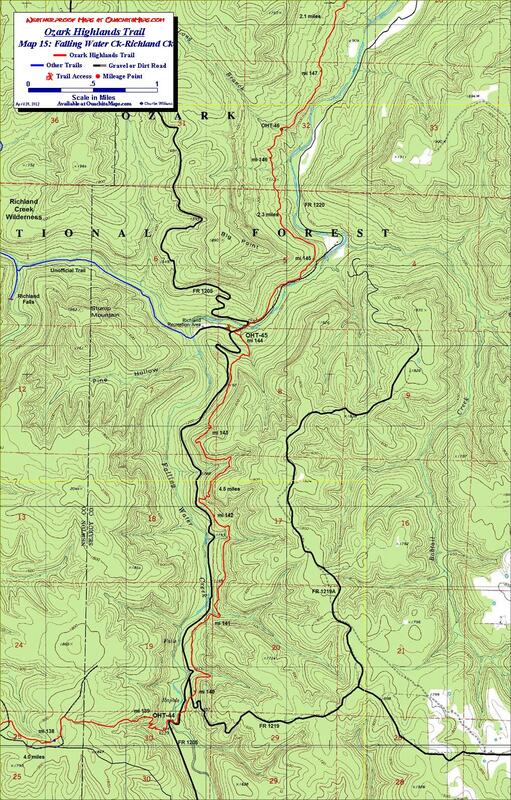 Woolum to Forest Boundary (OHT Map 17): This section starts at the junction of Richland Creek and the Buffalo River. It is accessible by the park road as described above; by the East Section of the Buffalo River Trail, which is just across Richland Creek; or by crossing the Buffalo River at the Woolum Ford. 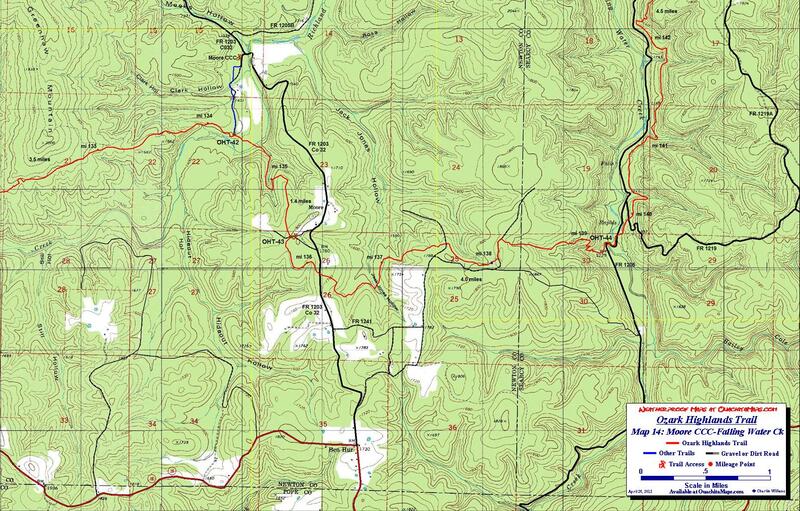 (Note: the park road is inside the Buffalo National River, which is administered by the National Park Service). The trailhead is in an open field on the floodplain (mile 165, OHT 52). The first 4 miles of the OHT is on the park road. Though the OHT is blazed in white, there are few markers on the road. Hiking south on the road, there are open fields on the flood plain to the east and forest to the west. There is an interesting topographic feature at about mile 164 called the Narrows, a thin spine of Mississippian age limestone and chert that separates the road from the Buffalo River. There are also a few old buildings. At mile 161 the trail leaves the park road (video) to the west . The intersection is well marked so you shouldn't miss it. If you get to the Richland ford, you did and will have to turn around. Once in the forest, you be on an old logging road as you gain a few hundred feet of elevation. After about 0.8 miles the trail leaves to the left and generally stays on contour. 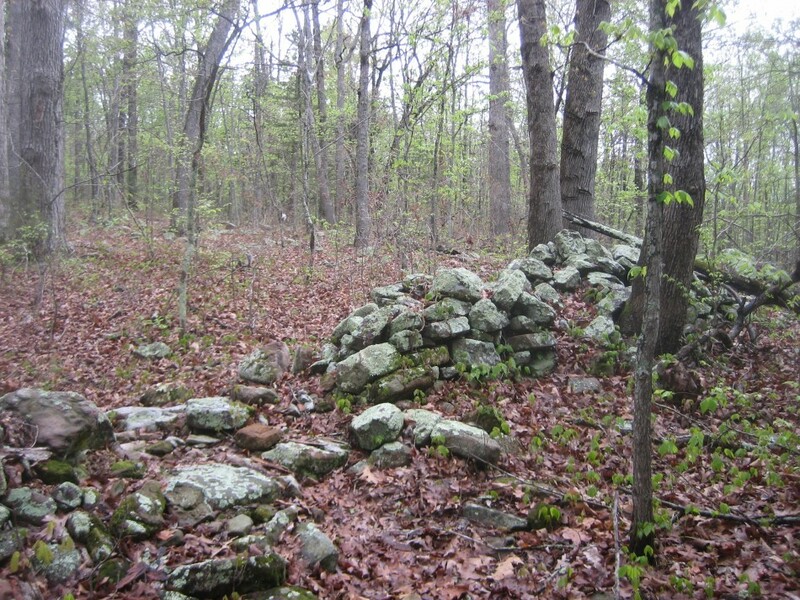 At about mile 159.2 is an old rock wall. 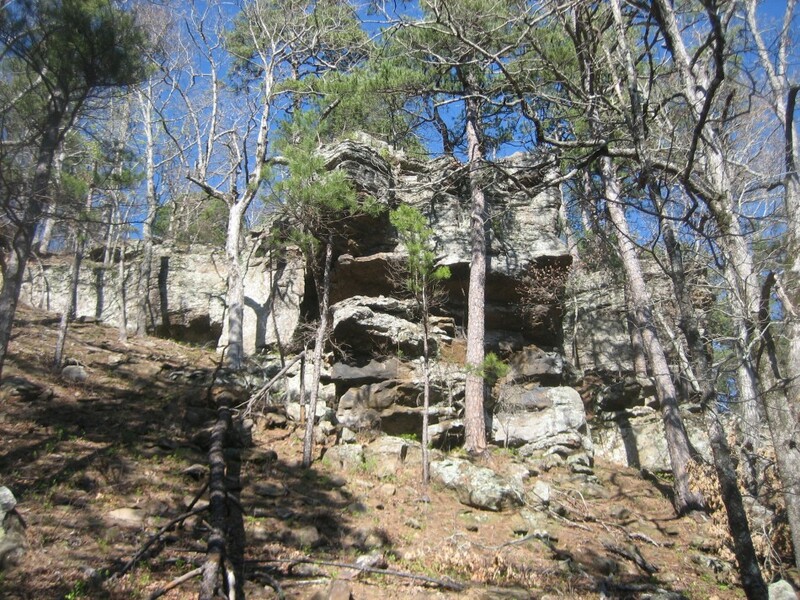 The first hollow is Leaning Rock Hollow (video) that features a bluff of Mississippian age Pitkin Limestone and a pour-off visible from the trail. The first time I hiked this section it was very dry and the seep below the bluff was the only water on this section of trail. Plenty of water this time. About 10 minutes further down the trail you will pass by the first of many huge boulders on the trail. We were moving pretty fast so I didn't take the time to look very closely but I suspect this is a boulder of the lower unit of the Witts Spring Sandstone that has worked its way down hill. 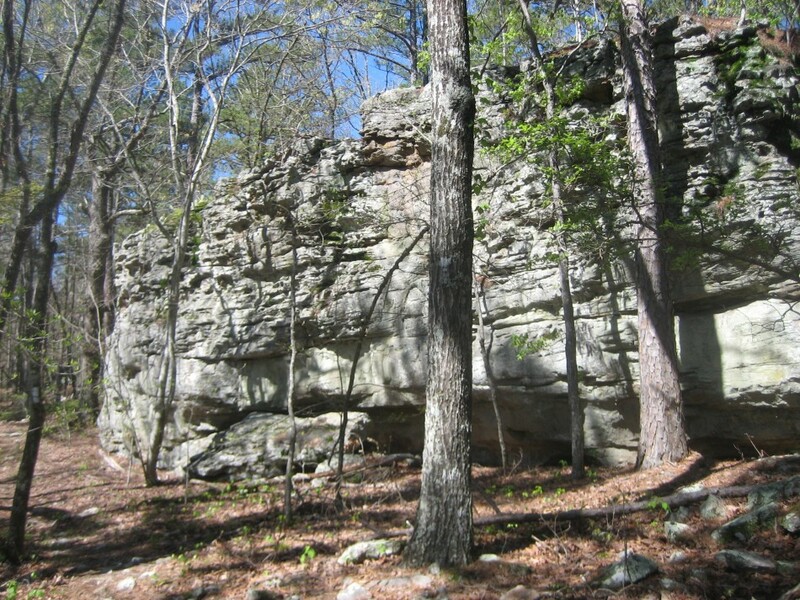 The Witts Spring Sandstone forms prominent bluffs further up the side of Horn Mountain. 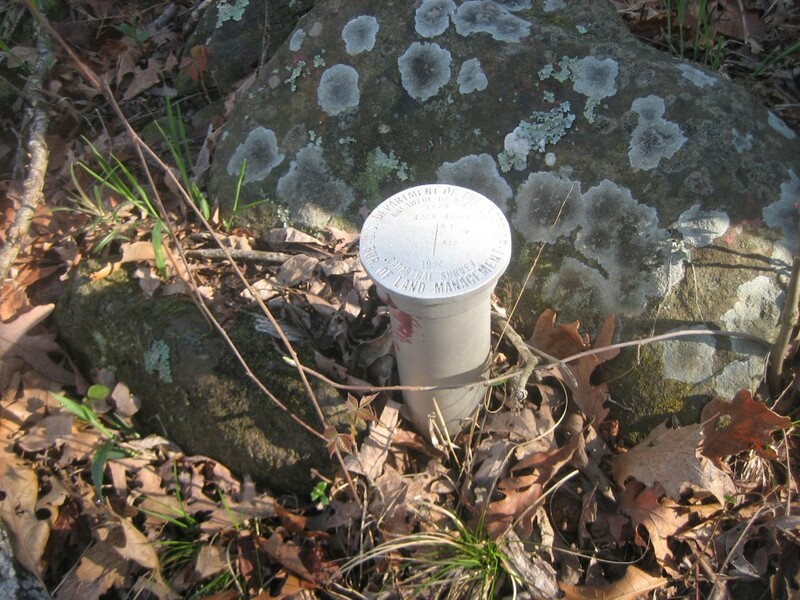 There are several others big ones like this before the National Forest boundary at mile 156.6. 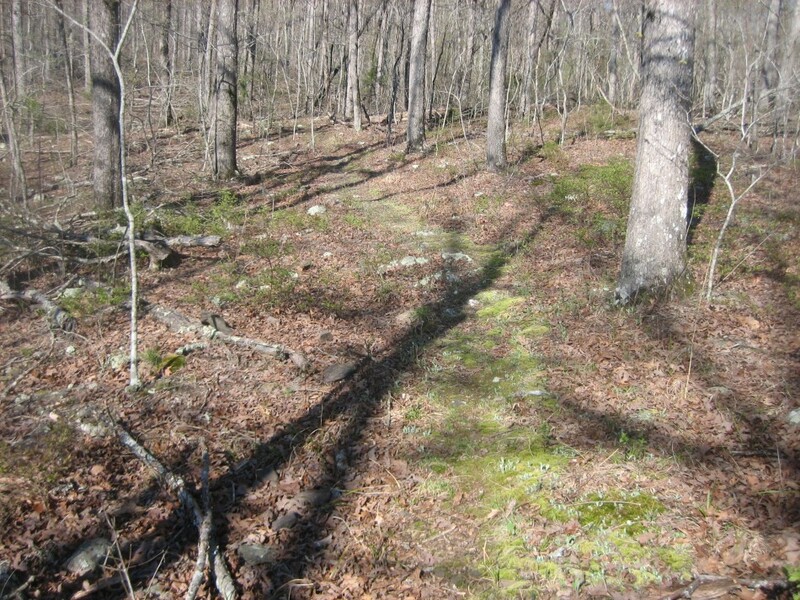 Forest Boundary to Richland Creek (OHT Map 16): Along the way are several more hollows. The named ones are Cedar, Winding Stair and Lawyer. There also many unnamed drainages (video) that given enough rain can have a pretty decent flow. Just before Lawyer Hollow, the trail crosses a wide bench that provided a large flat area to camp (video). It was quite extensive and could hold an entire scout troop. Water access for us was just a few hundred feet but if you have to rely on Lawyer Hollow for water, it may not be so convenient. The following morning we crossed Lawyer Hollow (video) and worked our way down to Dry Creek, which was definitely not dry. In fact, it was boots off (video). 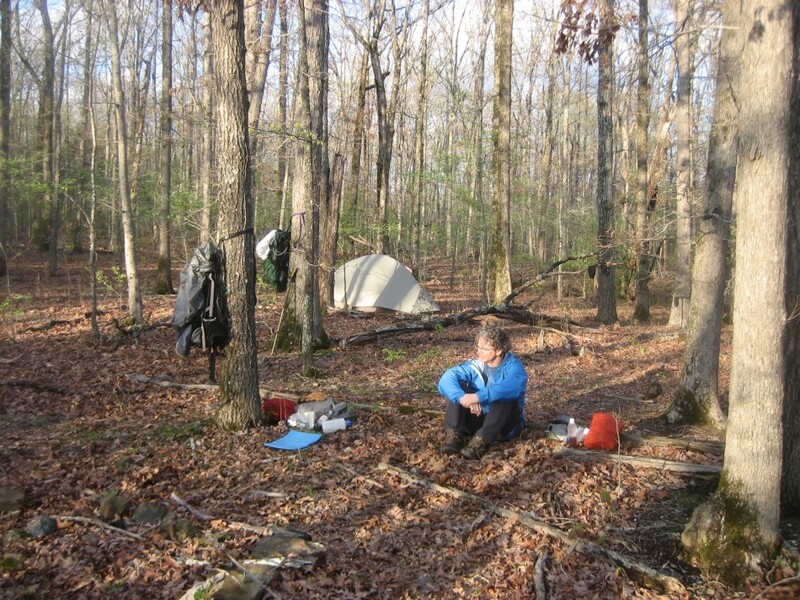 The OHT climbs a few hundred feet passing a small campsite, heads northeast and rounds a nose where you can catch some view of the Richland Creek valley. 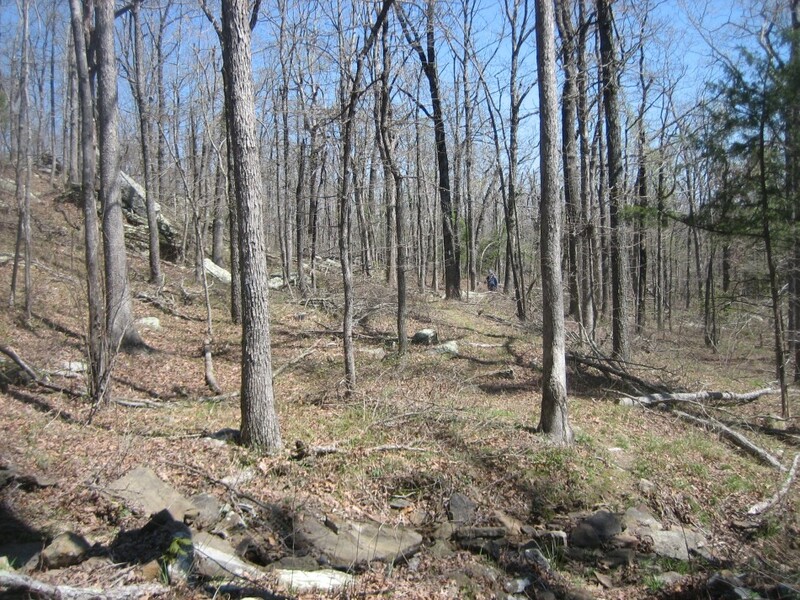 The trail turns southeast and follows a creek up hill At the top and to the right is a field where the trees on the top of the mountain have been removed. This is not you typical clear-cut, it looks like a full conversion to grassland. At the top of the hill is the FR 1201 trailhead. It is a small parking lot just off the Forest Road. At the north end is a gate to the aforementioned field. Follow the access road downhill to FR 1201 (OHT-48, mile 151.7). Cross it and enter the forest. The trail stays level for 0.9 mile and crosses a minor forest road twice. After the second crossing, the trail heads down hill into Turnpike Hollow. A little further down there is a spur trail across the creek that enters a rocky area in the pines that remind me of places I've hiked in New Mexico. 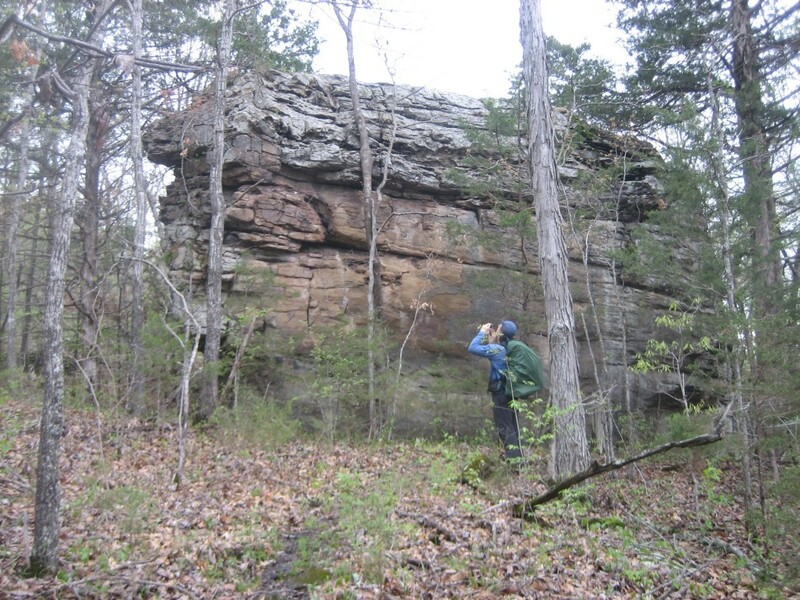 Further down and across the creek is a weathering bluff (video) of Witts Spring Sandstone. Leaving the hollow, the trail passes a fairly level open area and a series of house size boulders. After cutting between a couple, it swings north and drops below them. The trail reverses directions again and heads to Armstrong Hollow. With all the water, Armstrong (video) was a scenic place to cool off and have lunch. A lot water also meant an interesting crossing (video). The next 2.1 miles takes you to Long Branch (video) and OHT 46. On the way you pass Drury Hollow, a few other drainages and some more massive boulders. The next mile and a half is similar terrain, which take you just beyond mile 146. A little after that the trail is on a small bluff overlooking Richland Creek (video) and then comes to FR 1205. Richland Creek to Falling Water Creek (OHT Map 15): When you hit FR 1205, turn left and follow the road over the bridge. This should be passable by car or foot no matter what the water level in the creek (that said, should you encounter water, head for high ground!). Stay on the road for a few hundred feet until the trail turns left into the woods. Over the next 4 miles, the trail parallels Falling Water Creek and FR 1205. For most of this section the you can either see the road below or you are hiking up one of the hollows. There is also a major reroute. There was a huge landslide in 2009 that affected about 30 acres just south of mile marker 143. The trail used to cross a small drainage coming off the bluff from the left (southeast) and pass the mile marker. Now it makes a steep climb up the drainage, works it way around the nose of the bluff on a narrow trail (vista) and just about climbs to the top of it. Mile marker 143 has not been placed on the new section. Next the trail turns east and begins to head up the hollow below the cap rock supporting the bluff. Below you is a highly engineered area where the slide had been cleared, leveled and stabilized with anchors. The trail continues up and back down the hollow and begins to round the next nose wher you can get another view of the slide area (video). 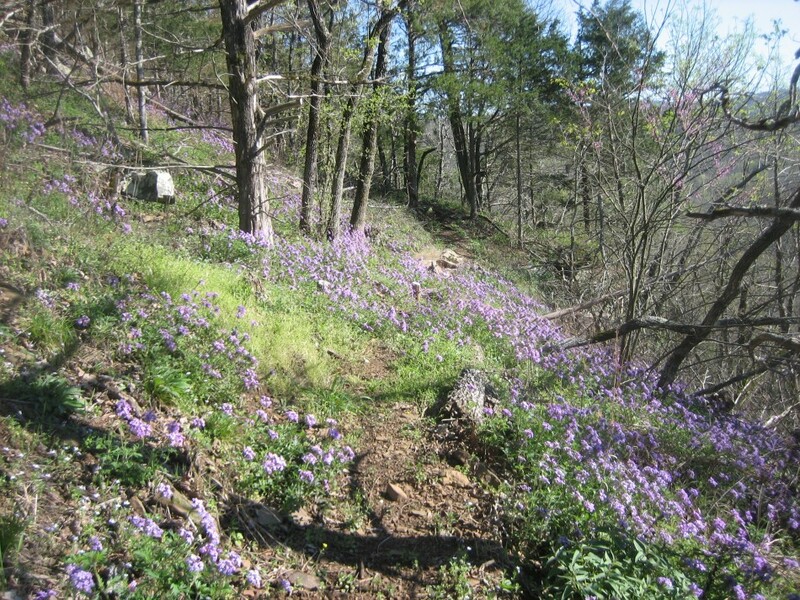 After being treated with a field of phlox covering the slope, the trail makes a steep decent back down to the old trail. There is a smaller landslide just before mile marker 142 that was flagged but rerouting was not complete. At the last hollow the trail picks up a little elevation and goes around the final nose. Then it drops down, crosses FR 1219, crosses a utility line right-of-way, crosses FR 1205 and goes to Falling Water Creek. At the creek there is a small campsite. The trail turns left (south) and comes out on FR 1205 at the bridge. Cross the bridge. Falling Water Creek to Moore CCC (OHT Map 14): Just past the bridge, the trail turns off the road but follows its general direction for few hundred feet. 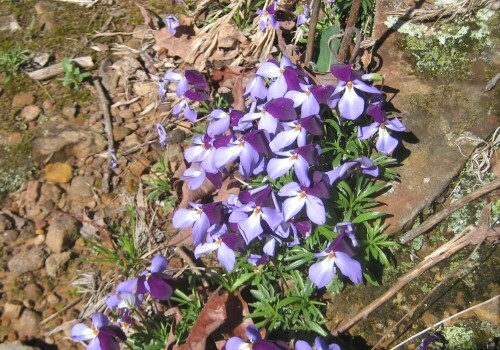 It crosses to the south side of a small drainage, starts climbing and then crosses back to the north side. Then there is a steep climb and some switch backs up a slope strewn with boulders and outcrops of Witts Spring Sandstone. The slope become more gradual as the trail reaches the top and heads west. At about mile 138.3, it hits a stand of short leaf pines and picks up a forest road bearing south. After a few hundred feet of hardwood forest, it passed another stand of pines, leaves the road to the west and passes a small wildlife pond. Just past mile 138 is the utility right-of-way. Except for a dip into a small drainage, the trail stays in the up land and rolls through the deciduous forest. At mile 136.2, the OHT crosses FR 1203 (Co 32). 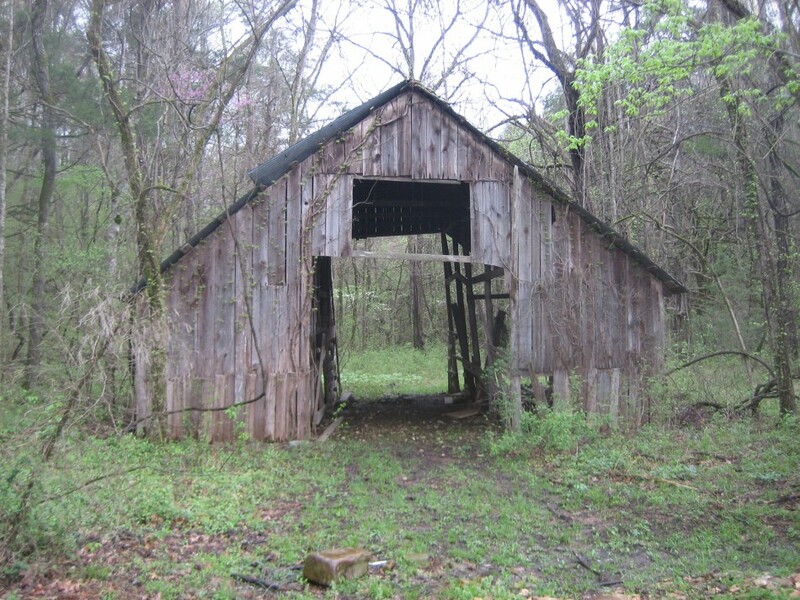 If the water at the Richland Creek crossing at mile 134.4 is too deep to cross, you will use FR1203 bridge and come into Moore CCC camp from the north (blue trail). 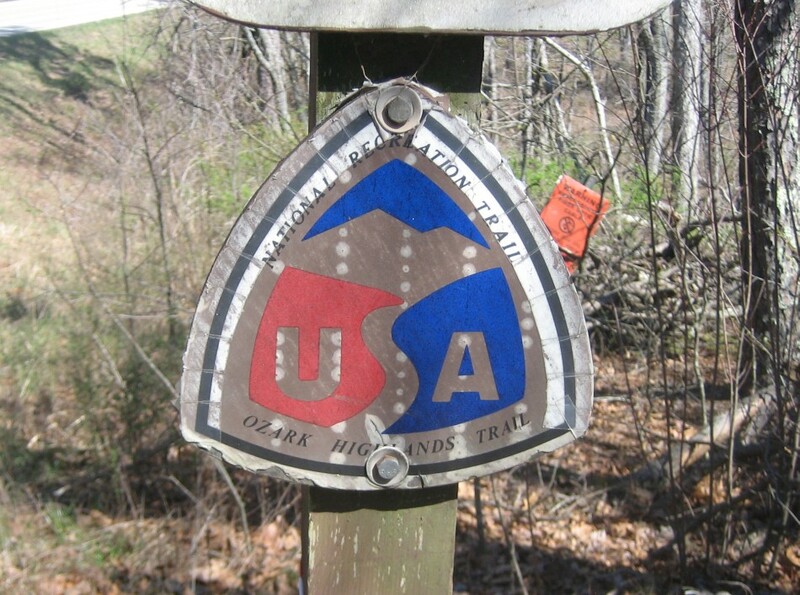 Otherwise continue on the trail past mile 136 to the Ben Hur/Moore Trailhead (OHT-43). From here it is 1.4 miles to the Richland Creek crossing, running fairly level for 0.6 miles, followed by a 200 foot descent into a hollow. If you can't cross, backtrack to the trailhead and take either of the forest roads shown on the map to get back to FR 1203. Moore CCC to Fairview (OHT Map 13): After crossing Richland Creek, the trail crosses some bottom land for about 0.2 miles. 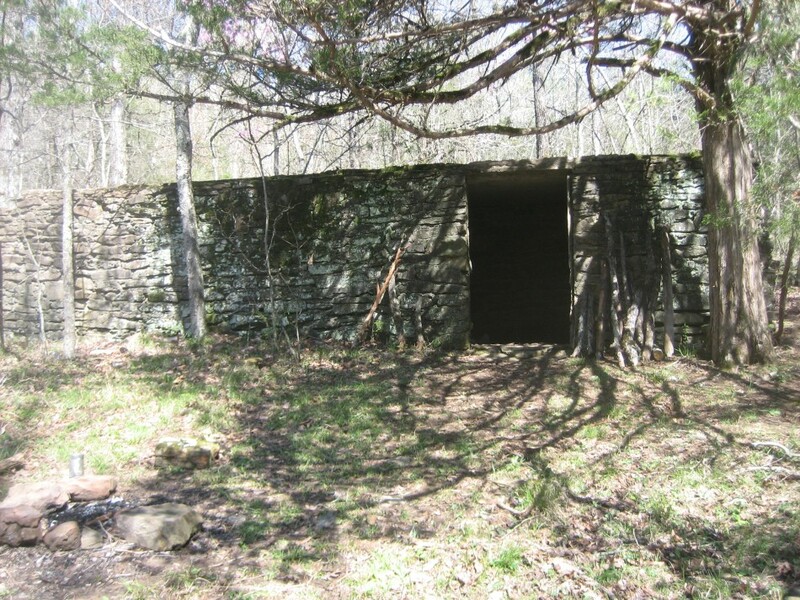 It comes out at the old Moore CCC camp (mile 134.2, OHT-42). All that remains is the foundation/basement of on of the building and a large camping area with a fire ring. 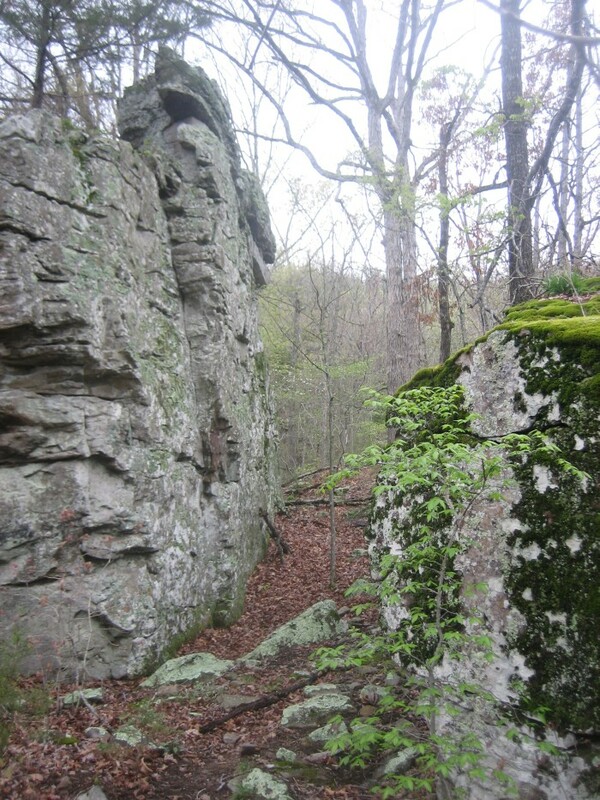 The trail gradually climbs back to the rolling up-land of Greenhaw Mountain and stays there for almost 2.5 miles. 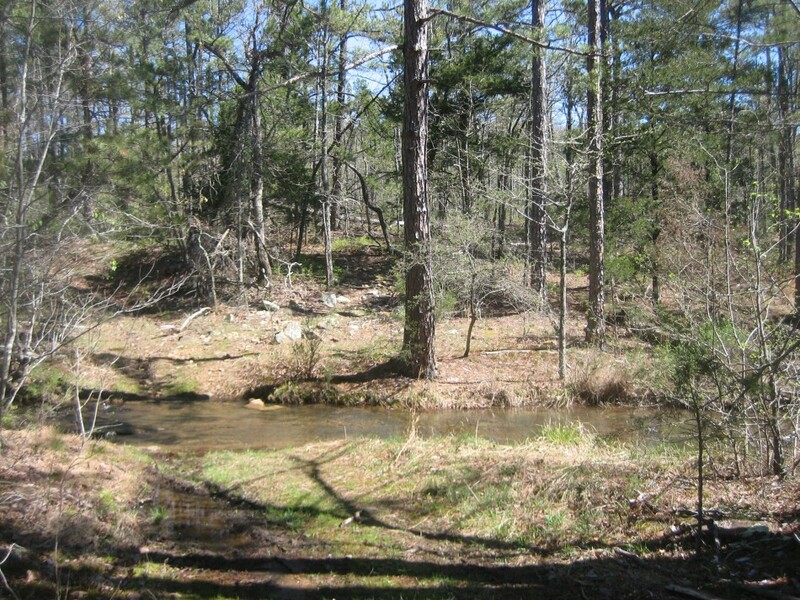 Though you will pass a few pine stands, most of it is the typical Ozark hardwood assemblage of oak and hickory with common occurrences of sweet gum, maple, dogwood and red bud. At mile 131.6, the trail completes a descent in to a broad unnamed creek valley and then climbs about 100 feet over another hill. After mile 131 it begins to make its way down to Greenhaw Hollow. Greenhaw is a wide, level forested valley that could camp a small army. 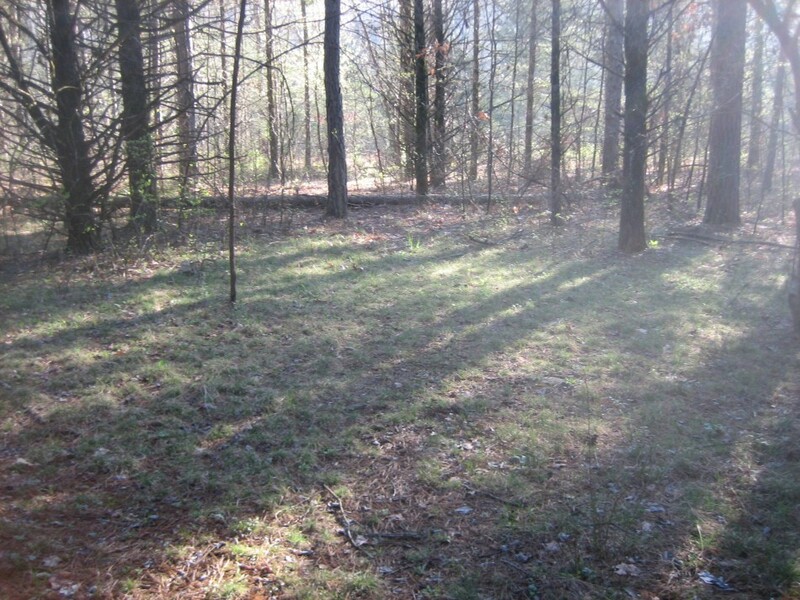 However, if you are a small party, there is a grassy glade in the pines and cedar on the west side of the creek. The creek crossing is on a rippled bedding plane of middle Bloyd Sandstone. Normally it is just a hop, but with the rain it was a wet crossing on slick moss covered rock. The trail heads south through an evergreen stand and then begins a slow ascent. It passes mile 131 and then tops out at a saddle at mile 129.5 where three forest roads come together. At mile 129.2 is a benchmark marking the boundaries of two townships and the beginning of a descent into Cox Hollow. The fact that this section of trail gets little use is evidenced by the moss on the foot path. Then its over another hill and down to FR 1255 (mile 127.2, OHT-40). The next 0.2 miles to mile post 127 is through clearcut. Then the trail crosses a small creek, meanders in some bottom land and then begins the climb to Fairview. Towards the top there are a lot of downed trees from the 2009 ice storm. Thank the OHTA for cutting a path through them. At the top of the mountain there is another utility right-of-way. Follow it briefly until the trail heads up hill to the right. 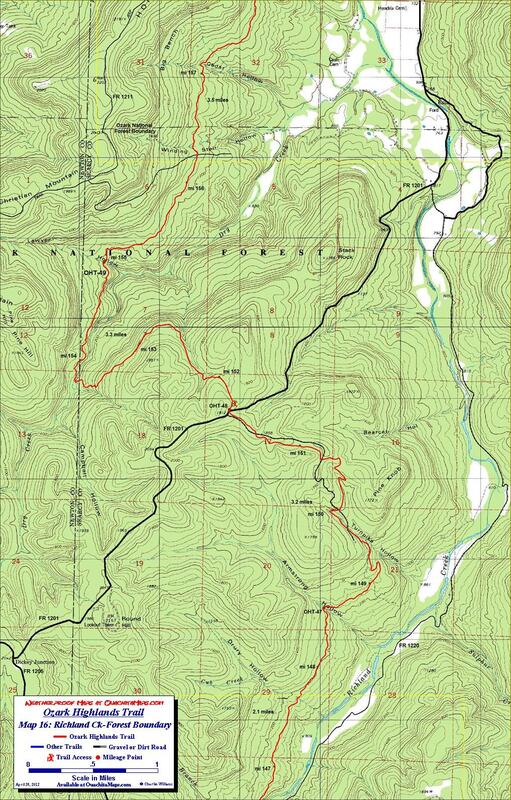 Cross AR Highway 7 and follow the trail to the Fairview parking area (mile 125, OHT-39). 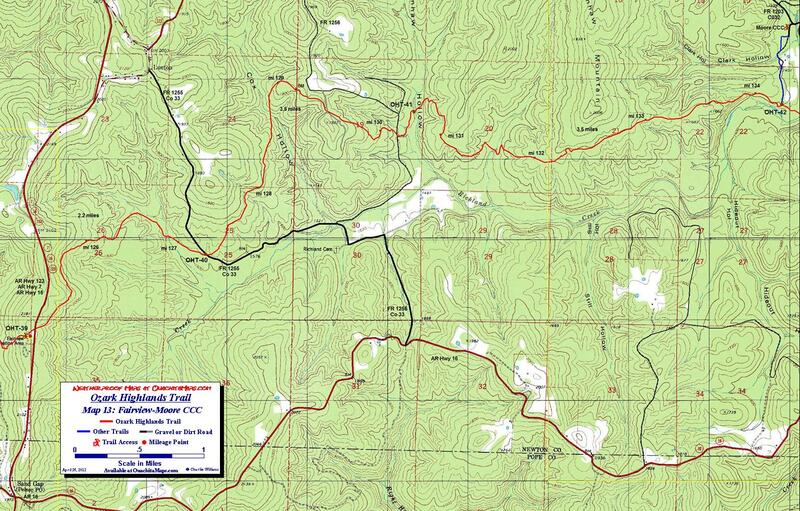 Info: USGS 7.5 minute quadrangle topographic maps:Sand Gap, Lurton, Smyrn, Moore and Eula AR (trail not shown). Ozark-St Francis National Forest, Russellville, AR (479) 964-7200. http://www.fs.fed.us/oonf/ozark/. 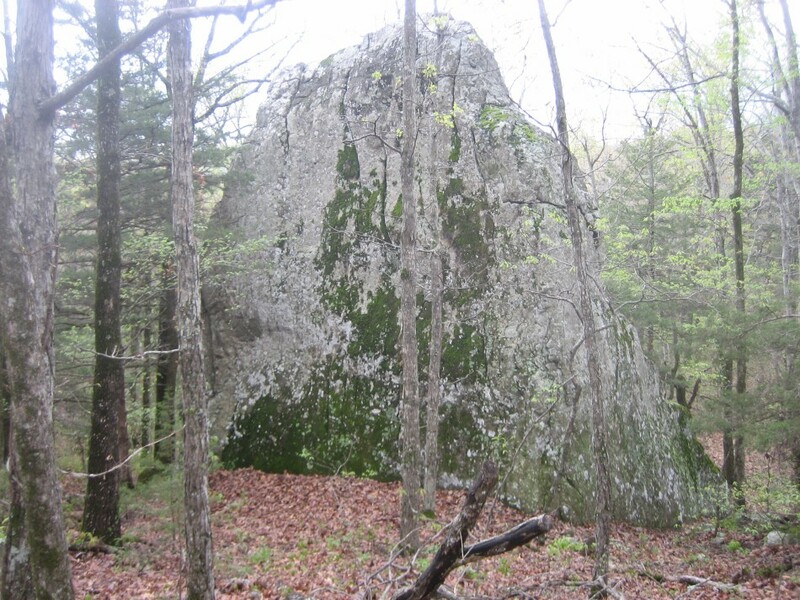 For Fairview to the National Forest boundary on maps 16 and 17 contact Big Piney Ranger District, Jasper AR, (870) 446-5122. 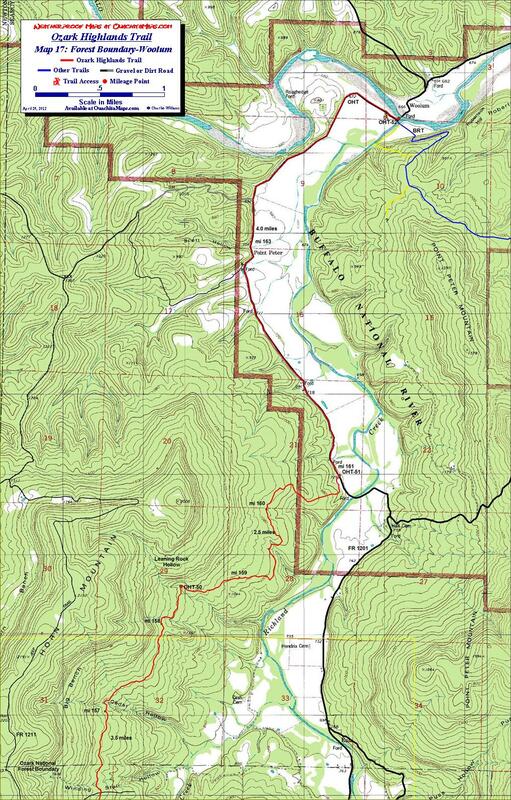 The short section north of the forest boundary to the Buffalo River National River, is in the Gene Rush Wildlife Management Area. 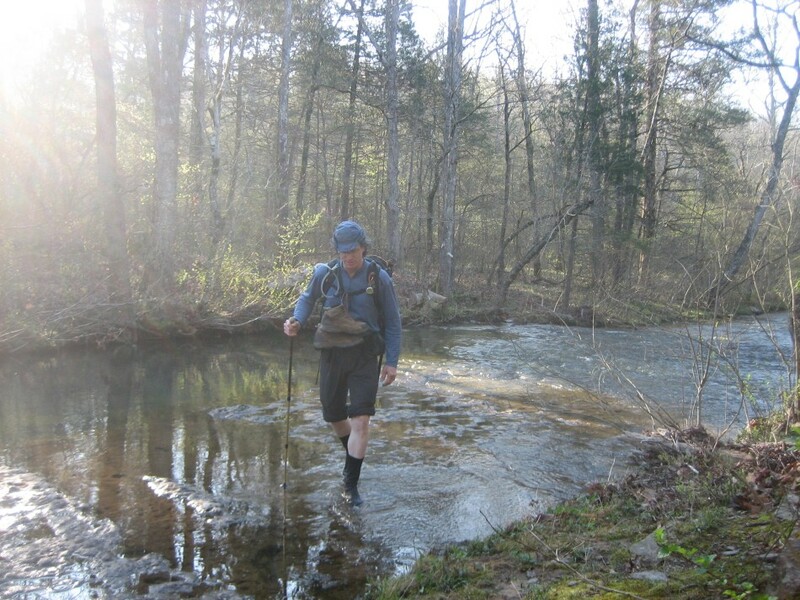 For OHT-51 to OHT-52, contact Buffalo National River Headquarters, Harrison, AR (870) 741-5443 or http://www.nps.gov/buff/. Logistics: For this trip we used Moore Outdoors, 479-331-3606. It is a very long shuttle so it cost $150. They dropped us at the Woolum gate and kept our car at their place until the morning we came put and then dropped it at Fairview. Our car stayed safe and they were very dependable.